Gavin isn’t allergic to peanut butter anymore! Yaaaaaay! We had to teach him before he could talk to tell people, “No peanuts for Gavin.” He’d had some bad reactions at a very young age and was tested to find he was allergic. It can be deadly for some people, so we were careful. The doctors didn’t know if he’d outgrow it or not. But after a lot of blood work and hours of testing, he has been declared non-allergic to peanuts. 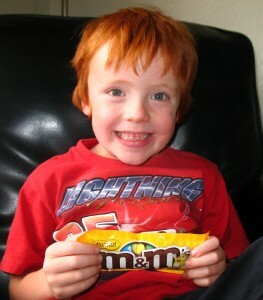 Peanut M & Ms – the best way to enter the world of peanuts, a gift from his Nonna! That is so cute!! I love the pictures and I LOVE that he can now have peanuts!! I will have to make him some peanut butter cookies soon…my favorite! I don’t know if I would be willing to trade Nutella for peanut butter. It is truly delicious!